Hanif Atmar (2008), Hanif Atmar 20100102 confirmed for second term as Minister of Interior, resigned 20100606. 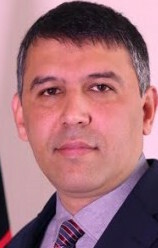 Umer Daudzai Minister of Interior (20130901) confirmed by Wolesi Jirga 20130925. Colonel Mohammad Wali Amini has been appointed as the Chief of the Police Rights General Directorate, while Colonel Ghulam Sediq has been appointed as deputy chief of the Police Rights General Directorate. The Afghan Government (MCIT, MoI and others) supported by a foreign company is working since 20100302 on this project. - BG Jalaluddin Ragbar commander of Wardak ANP TC. Order has also been given to MoI to suspend jobs of five other junior officials who were responsible to ensure security and decision making on the graduates of Wardak ANP TC. Major General Mohammad Masoud Andarabi Mohammad Masud Andarabi, Mohammad Massood Andarabi was born in Andarab district of Baghlan Province. After finishing his higher education he had higher education in Management and Information Technology. Andarabi has worked in several National and International institutions in different level positions; including seven years in UN Development Office as Afghanistan Development Program Project Officer. Andarabi is fluent in foreign languages; English, Arabic and Urdu, in addition to two national languages (Dari & Pashto).